What Do You Mean, She Don’t Eat No Meat? Not only that, but no milk either? What!?! How would my muscles even work without the protein and calcium of those two things? That’s what I used to think, too, until recently. So what changed? I started reading books by endurance athletes with impressive careers — and plant-based diets. Like this one and this one . If those guys can do it, why can’t I give it a try for a while? So once last month’s juice cleanse was done – and I had been meat and dairy-free for about a week and a half – I figured, why not keep going? But no: no “vegan” or even “vegetarian” for me. No labels whatsoever. I’m just a runner who decided to lay off meat and dairy for a while — and has been feeling great about it, recovering fantastically from races and long runs and running a wee bit better. Coincidence? Or result? I need more time to evaluate. 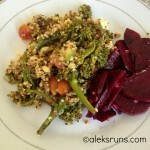 Recent lunch: Quinoa salad with broccolini, tofu, cherry tomatoes and beets. 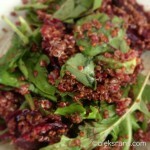 I am obsessed with quinoa! Gaby’s blog (which I used for juicing recipes) has some amazing quinoa salads that I’ve been making – with slight adjustments – all the time. Quinoa salad with mixed greens, avocado and beets. I’ve also been eating more beans and lentils (both are high in protein), lots of spring-mix salads and at least one avocado a day. Seriously. I bring my own avocado to work and people don’t even find it strange any more. That’s gotta be plenty of protein, right? Fitness test at the YMCA! A one-mile warm up, then crunches, push-ups and burpees (for 60 seconds each) and a 1.5-mile run. Not sure how all this took nearly an hour, we must’ve talked a lot? We were supposed to push it as hard as we can for the run, but I decided to save it for my 18-mile race on Saturday. Good idea? Or too conservative? What do you think? What do you do before races that you know you’ll do for fun – not shooting for a time goal or anything like that? Wow, 32 miles – that’s amazing!